I’m not a foodie, really. I enjoy a good meal, but I won’t go out of my way to get one. I’ve been known to live for a week on raisins or popcorn, just through sheer disinterest. That said, one good way to get to know a country is to eat what the locals eat, and I’ll try anything once (with a single exception that I’ll mention in a later list). Some things I loved, some I hated, and some I was still thinking about long after I left the country. That’s what this fourth article in the World Tour Highlights List series is all about. Here are the foods I miss, organized by country in the order I visited. It’s just fried rice, really, and by the time I’d been through Asia two years later I was heartily sick of fried rice. But I still really like paella. My mouth waters every time I think about the spices in Moroccan tagine. I think it’s almost all I ate in the country. Marrakesh’s narrow little alleys fill with tagine smell and woodsmoke every evening, and it tastes even better than it smells. Served in a silver teapot. Green gunpowder tea with lots of mint and lots of sugar. Poured with the small glass catching the long stream from the teapot held high above. I remember the first three words I spoke in Germany, immediately upon stepping out of the train: zwei Brezeln bitte. It’s just a lightly spiced beef stew, really, but I love it. There was a good gelateria near my old apartment in Toronto, and I thought I knew good gelato. But the gelato in Rome was even better, and in Buenos Aires the best of all. I’m prepared to defend the reputation of the heladería Cadore unto death, if necessary. Hard to say I miss it since at the time of writing I’m still in Buenos Aires and going there twice a week, but I know I will miss it. French food is amazing, but Europe was very expensive and Sheryl and I were forced to live more or less on ham sandwiches, so my experience is limited. But crèpes are cheap and we ate them daily while we were in Paris, and I miss them. Really good. Sweet and spicy, I put it on almost everything. Found it again in New Zealand of all places, for three times the price, and had to strictly ration myself. Cheap but good fish restaurant chain. We ate there all the time. I love Indian food. To be honest it’s one of the main reasons I went to India, so that I could pig out on cheap Indian food. I could fill a Top 15 list just with Indian Food I Miss. Southern, northern, I like it all, especially when it’s homemade. On the street in giant boiling vats, in the home or on the train in paper cups, masala chai is everywhere and really good. Going a day without a visit to the chai-wallah was unthinkable. Sheryl isn’t fond of Indian sweets – she says they’re too sweet. I dispute that there is any such thing as “too sweet” and I love them. Laddoos and gulab jamun are my favourites. They’re not really Nepali cuisine, coming instead with the wave of Tibetan immigrants, and they’re really just filled dumplings, but I loved them. Maybe just because it was a rare alternative to the monotonous Himalayan trekking diet of daal baht or fried noodles. A strong, smoky, firm yellow cheese. Really good, and excellent trail food. I didn’t get this until we reached yak altitude high up on the Annapurna circuit. The original and still best, whether for breakfast at a tiny restaurant in the Tsukiji fish market in Tokyo where we’d waited an hour to get in and the fish was caught ten minutes before, or prepackaged from the convenience store. The perfect food, as far as I’m concerned. A sweet barbecue-sauce cabbage pancake-pizza with various toppings. I ate it almost weekly at a cheap lunch restaurant back in Toronto and the homeland version didn’t disappoint. One of the most delicious things in the entire world. The father of our friend in Tokyo sent over a box of eels one day. Sweet red bean paste in a squishy rice-gluten ball dusted with sugar. Triangular vinegared-rice packets with various fillings, wrapped in seaweed. A mainstay of my Japanese diet. I do love my chocolate-coated pretzel sticks. These kept me alive in a country where a lot of the food was… challenging. Char siu bāo (barbecue pork buns) and dòushābāo (sweet red bean paste buns) are my favourites. Sidewalk stalls line the streets in these two provinces, selling what we came to call “stick-food” – anything and everything impaled on bamboo skewers, spiced and grilled. Quail eggs, flat noodle rolls, lotus-root slices or bits of meat (best not to ask which bits). It’s all so, so good and so, so spicy. Seriously dense, sweet and lardy. Another thing that kept us alive in China – I’m just glad we were there in the weeks leading up to the Mid-Autumn Festival. You could probably live on one little one a day, though they come in sizes starting at three bites and going up to dinner-plate size. They do iced coffee really nicely in Cambodia. Strong and thick, poured over lots of ice, and a layer of sweetened condensed milk on the bottom to stir in. In Siem Reap I had several every day. The best black pepper I’ve ever tasted, bar none. Before the Khmer Rouge days it was a major export for Cambodia. The bad years ruined the pepper export trade but it’s slowly recovering. I sent a big bag of Kâmpôt peppercorns home to my brother, thinking that as a former chef he’d appreciate it. I hope there’s some left when I get home. A spicy noodle soup with various toppings, made with Malaysia’s famous belacan - fermented shrimp paste. During our time in Kuching in Borneo Sheryl and I went to the same laksa man a few times every week. There are as many different varieties as there are cities in Malaysia (and Singapore) but my favourite is Sarawak laksa made with ridiculous amounts of black pepper. Milo is a sweet malted chocolate drink powder mix found all over the world, and ais means, well, ice. I’ve had Milo in many countries, but there’s something better about Malaysian Milo. I spent six months in Malaysia and I doubt I was ever seen without a takeaway plastic bag full of Milo ais, with a straw sticking out of it. Our friend Wong from Kuala Lumpur tried to bring a kilogram of Milo powder from Malaysia to us in Australia because we missed it so badly, but it was confiscated at Australian customs. I could have cried to think of all that lovely Milo being incinerated. Such a tragic waste. Looks like a fuschia-red fleshy pineapple with firm flesh inside, red or white with speckles of tiny black seeds. The red ones are best. They grow on strange cactus trees. The Queen of Fruits. Impossible to get outside Southeast Asia because they don’t ship well. A squash-ball sized hard purple fruit with four green leaves like a persimmon. Crack it open gently and the white pulpy segments inside look and feel like lychee flesh and taste like a strawberry pineapple. My very favourite fruit in the world. 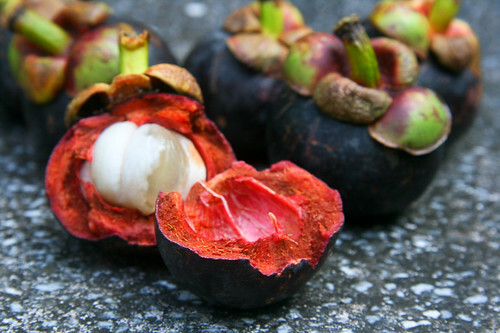 We were lucky to be in Malaysia during mangosteen season, and we always had a kilogram in our food bag. Golf-ball sized oily dough balls filled with sweet paste and rolled in sesame seeds. Came to Indonesia from China by way of Malaysia, but Indonesia is where I ate them. Sold anywhere a bus stops long enough for snack hawkers to jump on board. Possibly the least healthy item in this list of unhealthy items, but I really did love them. Hard coffee-flavoured candies sold in every shop in Indonesia. If you don’t crunch them they can last for an hour, but I always crunched them. At the Kawah-Ijen sulfur mine I was handing out Kopikos to the miners so they’d let me take their pictures. Crunchy round biscuits with a layer of white mint paste, coated in chocolate. Sheryl and I were uncontrollably addicted to them and we must have eaten fifty packets during our year in Australia and New Zealand. 13 to a packet, so we had to engage in delicate but deadly-serious negotiations every time, to see who got the last one. man I can’t wait until we finally reach a place where we can afford to eat out…. i am sooo looking forward for the food in India! YUM!!! It’ll come, and just imagine how good it will taste after such a long wait. And I’m sure Kendall will enjoy the naan. so i read the gross food list first, cause i wanted this list to make me hungry again…everything on this list that i have ever tried i agree with. especially indian food. hells yeah…and dragon fruit. i would happily punch a random stranger on the street for dragon fruit. and those peppercorns? LOOOOOOOOOOONG gone :):):) one of the best things i have ever eaten. 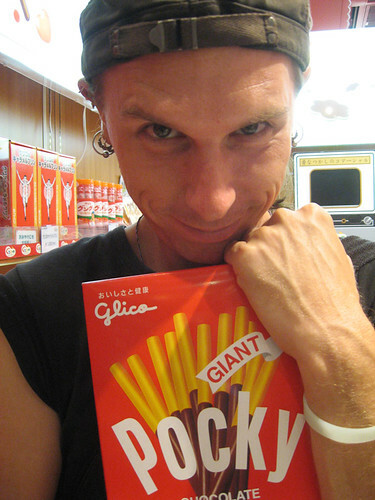 mmmm, pocky…bought some last week.